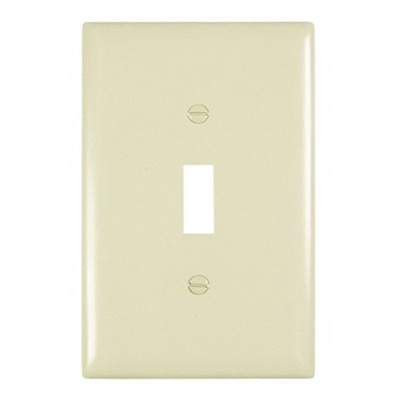 Pass & Seymour TradeMaster® 1-Gang Jumbo size wallplate in light almond color, features rugged, practically indestructible self-extinguishing nylon construction. The 0.07-Inch thick rectangle wallplate has dimensions of 3.3125-Inch x 5.0625-Inch. It has one toggle switch configuration. Unbreakable wallplate offers vertical orientation. It is suitable for hospital, industrial, institutional and other high-abuse applications. Wallplate is cULus listed and RoHS compliant.